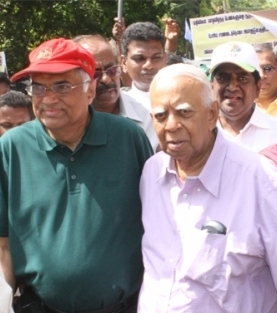 Under certain circumstances, it would have been good news that the main democratic opposition, the UNP and the main Tamil parliamentary party the TNA, together with a sprinkling of leftist groups, are to be partners in a renewed effort at Opposition unity. In the current and foreseeable circumstances however, that is good news only for the incumbent administration and its propagandists. Such an alliance today would be electorally radioactive. It will impact negatively on the opposition’s already imperilled performance at the upcoming provincial level elections. As a general rule, an alliance of the UNP with the Tamil nationalist parties has been deleterious for both. The so-called Dudley-Chelvanayagam pact had a negative impact electorally and caused, as a by-product, divisions within the UNP administration. The more distressing consequence was that faced with a UNP-FP bloc, the Opposition incorporated chauvinism into its populism, and when it went on to win the election, that admixture fuelled policy, from standardisation to the ’72 Constitution. One reason is of course, plain racism– if so, it can and must be combated; certainly not pandered to. However, that is not the sole factor involved. It must be recognised that, with a few notable exceptions, the UNP is generally not trusted as sufficiently patriotic by the electorate, and is perceived as a pro-Western and minoritarian party. The image of minoritarianism is enhanced by any alliance with a pronouncedly nationalist Tamil party. There have of course been important exceptions. DS Senanayake led a multiethnic coalition. He could easily afford to, as he was trusted in the Sinhala heartland and his Tamil partner the ACTC was a moderate integrationist formation. Strikingly, JR Jayewardene swept to 5/6ths majority in parliament, with the CWC leader Mr Thondaman by his side. The Tamil nationalist TULF was not part of that coalition and the trade union chief Mr Thondaman was the very model of strong campaigner for integration not on the basis of supplication but of equality of rights. Today’s UNP already suffers electorally by being led by someone whose personal appeal makes Mitt Romney seem as magnetic as Bill Clinton. He is also perceived by the electorate as the Grand Appeaser of the Tigers. Meanwhile the TNA swings between the staunchly liberal democratic (the legal activism of its MPs during the impeachment motion must be applauded) and the strident call for international accountability inquiries into the conduct of the armed forces. We may debate the validity of such a call, but what is relevant here is that it is outside the parameters of the national and the patriotic; arguably outside the boundaries of the Sri Lankan political community itself. Gen Sarath Fonseka was electorally wounded by embracing a political suicide bomb, in the form of his meeting with and endorsement by a TNA widely perceived as fellow-travellers of the Tigers, irrespective of the fact that he could not have won that election even if it had been supervised by UN blue helmets, running against Mahinda Rajapaksa immediately after the war. These two factors make a UNP-TNA alliance an electoral marriage made in hell. Either the TNA has to abandon its strident call on alleged war crimes and drop the radical Tamil nationalists from its ranks or its interaction with the mainline Opposition has to be limited to single issue united actions. Even so, the optics may just not be right. Thus the single issue convergences should be left to individual MPs such as the courageous and charming Mr Sumanthiran. With foes like a Ranil-TNA alliance (and a sprinkling of anti-war activists such as Wickremabahu), President Rajapaksa does not need friends. The same goes for the factor of international pressure. What Sri Lanka needs is international solidarity, not international interventionism. International solidarity stops where national sovereignty starts. International solidarity reaches out to people, to citizens, and respects the nation; interventionism targets states and breaks up nations. The Age of Reason’s founding document of people’s sovereignty and individual rights, the Declaration of the Rights of Man and the Citizen (1789), affirms in its third article that “The principle of all sovereignty resides essentially in the nation. No body nor individual may exercise any authority which does not proceed directly from the nation”. There was a valid, invaluable campaign of solidarity for the Arab Spring in Tunisia and Egypt and a disastrous campaign of interventionism in Kosovo, Iraq and Libya. If anyone thinks that solidarity and sovereignty, or to put it another way, strong manifestations of solidarity and strong opposition to interventionism, are incompatible they should study the politics, diplomacy and ideology of Lula’s and Dilma Roussef’s Brazil, which accords high value to peoples’ solidarity just as to national sovereignty, and stands opposed to ‘liberal humanitarian’ interventionism. This is truest of course, of the stance of the progressive Latin American nations that form ALBA, the Bolivarian Alternative. It is Ecuador’s Rafael Correa, a vocal defender of sovereignty, who also gave shelter to Julian Assange, a crusader for transparency in government and the people’s right to information. Whatever external pressure there is must be ‘smart pressure’ and not dumb pressure as there has been until now. The problem with the international factor is that it has been in the main, responsive to the Tamil Diaspora and Tamil Nadu, which is understandable given the electoral arithmetic. However, it is a radically reverse arithmetic that prevails in Sri Lanka. Thus international pressure so far has gone up against the sentiments of the vast majority on the island, which is where the change has to be. Neither regime behaviour nor the regime itself can be changed by international pressure which runs completely contrary to the deeply felt sentiments of the vast majority of the citizenry. As in the case of newly emergent or re-emergent democracies from Portugal, through Latin America to the Philippines and the former Soviet zone, any real change must carry along with it, the military. After a vastly popular military victory, a large army drawn from rural areas in an electorate dominated by rural voters is more significant than is most other socio-political contexts. If any Sri Lankan opposition strategist, democracy activist or policy-planner in the West thinks that the armed forces are going to shift so as to enable a level playing field or guarantee a change, as long as a transfer of power will be to a coalition that countenances a call for war crimes investigations and therefore may bring one in its wake, then these cosmopolitan liberals and democrats are smoking some substance that is highly hallucinogenic. That is why democratic opinion (be it in the party political or civil society spaces, be it Sinhala or Tamil) and international players (be they states or global civil society) have a choice to make, between the project of re-democratisation and that of accountability. It has taken 30 years for Guatemala’s Gen Rios Montt to be brought to justice. It has taken 40 for the equivalents in Brazil, Argentina, Uruguay and now, Bangladesh. As for conflict resolution and transformation, the Sinn Fein/IRA has not mounted a global campaign for the prosecution of those responsible for the Bloody Sunday massacre or the callous disregard that resulted in the deaths of Bobby Sands and the hunger strikers. Democratic re-opening and conflict transformation would have been impossible had accountability—especially international accountability–been on the agenda during the long, complex transitions. No seriously consequential solidarity campaign can accommodate calls for international inquiries on accountability as well as calls for re-democratization. The accountability slogan can split or shrink any coalition for democratization, in Sri Lanka as well as among Lankans throughout the world. International accountability can be a suicide bomb under the democracy movement. The accountability drive can sink the democracy agenda.